Whenever Ichorclaw Myr becomes blocked, it gets +2/+2 until end of turn. 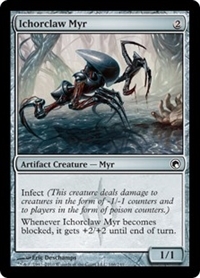 1/1/2011 Whenever Ichorclaw Myr becomes blocked, its last ability triggers just once, no matter how many creatures it became blocked by. It will get just +2/+2.